After leaving Egypt, God directed Moses to prepare a portable sanctuary, a tabernacle. This became a sacred place where the wandering Hebrew people could commune with God. We learn in Exodus that skilled women prepared the woven materials needed for the tabernacle. Later these highly trained weaving women worked within the temple compound. In Hebrew, the word used for “skilled” is related to the word “wisdom.” Culturally, the Hebrews saw the technical abilities of artisans as a form of profound understanding. 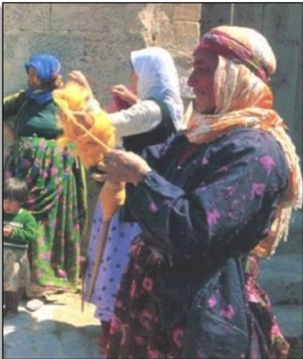 Thus we find that women’s traditional work of weaving was highly prized not just for the domestic and economic benefits but for religious and spiritual reasons as well. “When textiles were needed for ritual purposes, as in the case in the tabernacle texts, women’s skills in preparing fabrics and converting them to specific forms situates them in positions of social or religious prominence; it gives them a public role that has been little noticed” (Carol Meyers). The curtains the women wove for the tabernacle were made of fine variegated and twisted linen and wool, a process that required exquisite skill. They used yarns of blue, purple and crimson interwoven with silver and hammered gold threads. According to 1 Kings 6:29, figures of cherubim were embroidered on the veils that shielded the most holy space of the tabernacle (and later the temple in Jerusalem). Cherubim (Hebrew masculine plural of cherub) were not the chubby winged babies of Renaissance paintings. Rather they were conceived as quadrupeds with human heads, a body of a lion and wings (see 2 Sam. 22:11, Ps. 18:11). According to Josephus and other early Jewish historians, the veils were decorated with scenes of sacred trees, bulls, eagles and lions. The whole design was symmetrical and bordered by lotus buds (another design element of Solomon’s temple). The cherubim were seen as protective guardians of the Tree of Life which they flanked. The word cherub is borrowed from the “Assyrian kirubu, from karâbu, ‘to be near’, hence it means near ones, familiars, personal servants, bodyguards, courtiers. It was commonly used of those heavenly spirits, who closely surrounded the Majesty of God and paid Him intimate service. Hence it came to mean as much as ‘Angelic Spirit'” (Dhorme). Skilled as they were, is it possible the women weavers had a part in designing the sacred partitions they wove for the tabernacle? Did they see a large mystical pattern, an image of the universe, a metaphor for the panorama of the heavens? Did the beauty of their work draw them closer to God? If weaving is a form of wisdom, can other domestic chores be considered wise? Borowski, E. – “Cherubim: God’s Throne?.” Biblical Archaeology Review, (Jul/Aug 1995) 36-41. Cleveland, R.L. – “Cherubs and the ‘Tree of Life’ in Ancient South Arabia,” Bulletin of the American Schools of Oriental Research 172 (1963) 55-60. Dhorme, E. – “Les Cherubins. I: Le Nom.” Revue Biblique 35 (1926), 328-339Foote, T.C. – “The Cherubim and the Ark,” Journal of the American Oriental Society, 25 (1904) 279-286. Haran, Menahem – “The Ark and the Cherubim” Israel Exploration Journal 9 (1959) 30-38. Mettinger, T.N.E. – “YHWH SABAOTH – The Heavenly King on the Cherubim Throne,” Studies in the Period of David and Solomon and Other Essays, T. Ishida, ed. Pfeiffer, R.H. – “Cherubim” Journal of Biblical Literature 41 (1922): 249-50. Rosenvasser, A. – “Kerub and Sphinx: More on the Phoenician Paradise,” Milla wa-Milla, 12 (1971) 28-38.